Feral pigeons are descended from wild rock doves that have interbred with different strains of escaped ornamental, domestic and racing pigeons over the centuries. They now thrive in our towns and cities having fully adapted to the urban environment. A pigeon's natural food source is grain and seeds but they survive in towns and cities by scavenging processed food matter, such as the remains of takeaways and food waste from dustbins. Given an adequate food supply pigeons can breed throughout the year, although the peak breeding season is between March and July. Pigeon droppings (or pigeon poop) and pigeon debris are not only an aesthetic issue but can directly damage the structure of a building. Pigeons are also carriers of a number of serious diseases such as salmonella and psittacosis (commonly known as pigeon fancier's lung). Their droppings provide the ideal environment for organisms causing diseases such as listeriosis, cryptococcis and aspergillosis to thrive. Pigeons are also hosts to fleas and other parasites such as pigeon ticks and bird mites. These pests can be spread to other hosts including people. One of the most successful long term measures for controlling pigeons is to remove their food sources, however this is not always possible. At Kapow, we have a range of measures we can implement to keep those pigeons at bay. Its that time of the year when gulls will be pairing up and getting ready to nest. Gulls cause a variety of problem: noise/nuisance; gull attacks; structural damage as, during their nesting period, gulls bring to their nests lots of materials and food stuffs (bones etc.). These at the end of the season are likely to get washed away, inevitably ending up blocking drains/gullies. 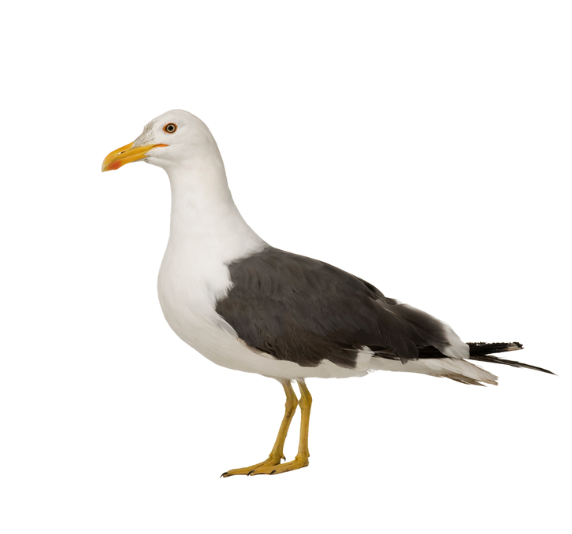 kapow Pest Control can survey your site and give you advise when it comes to dealing with gulls. The only acceptable reasons for removal of eggs/nestling/nests, is that the gull/s present a public health or public safety risk - in fact it's illegal to do so for any other reason and such activity has to be carried out by a licensed professional. The commonest need for gull control revolves around either roof nesting gulls or gulls acting aggressively towards people. Usually these two reasons can be linked together, i.e gulls will try to protect their eggs/nestlings against a perceived threat and if you’ve been struck by a gull you will already know the damage they can inflict, in fact two people in Britain have been recorded as dying as a result of gull attacks! Bird droppings carry many diseases transmissible to humans, including thrush, E. coli and salmonella poisoning, not things you would want in or around schools, hospitals, food handling areas etc. Seagulls also carry a range of ecto-parasites (including bed-bugs, fleas and ticks) and these are also known to affect humans. Kapow Pest Control have specific disinfectants that will sanitise your premises, thus reducing the potential of bird related diseases from being transmitted. Gulls tend to be relatively quiet whilst sitting on eggs, but can become very raucous once the eggs have hatched and at this stage they become far more aggressive towards people. To remove a health and safety risks once birds have started nesting, it's necessary to prevent the eggs from hatching. This could be achieved by simply taking or breaking the eggs, but then the gull will usually lay more eggs. For this reason, we substitute plastic eggs - by the time they realise the eggs are not going to hatch, its too late to lay a new clutch.